I never thought, following Ed Brubaker’s Death of storyline, that Captain America could break my heart again. In the years since he was gunned down in the aftermath of the first Civil War I’ve watched Steve Rogers, and the men who carried the shield in his absence, flourish and fall as destiny pushed them onward, ever onward down the road leading to Secret Empire. But throughout all of the trials and tribulations of the various Captain Americas I never imagined that I’d ever end up feeling that same way as I did when Steve Rogers bled out on those cold, rain soaked steps; until I read End of the Line. 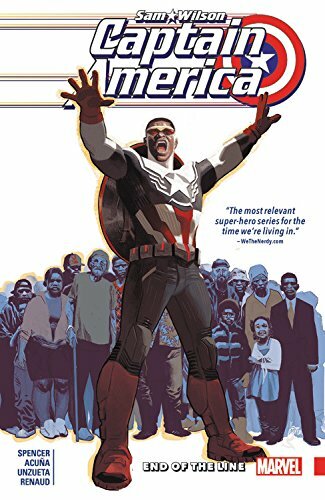 And I never thought, not even in wildest dreams, that the Captain America that would emotionally gut punch me and bring that wave of sadness flooding back would be Sam Wilson. To me he had become the right Cap for the world, the one that it needed to believe in as a symbol of all that was right and true, a street level hero committed to justice and proving that it was an inalienable right of, and for, all men and women while Steve Rogers sat in his ivory tower dealing with extinction level and planet ending events. Sam Wilson was the Captain America the world so desperately needed, it’s just a shame that in End of the Line, the world doesn’t feel the same way about Sam as it shatters his faith both in himself and in everything that he holds dear, and in doing so makes him to turn his back on the shield.